We left Lisbon and flew to Marrakesh. We arrived mid morning and headed to the main square; Jemaa el Fna. We ate our first lunch in Cafe de France on a balcony overlooking the square. It was a great view point to see all the activity down below! They have a set menu of salad to start, tagging for main and then oranges for dessert. 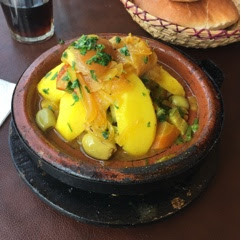 We went for the Vegetable Tagine, pictured below, and it was very good, full of veg. We decided to have dinner in our Riad the first evening, just for ease really and this felt like a home cooked meal as we were the only people eating. 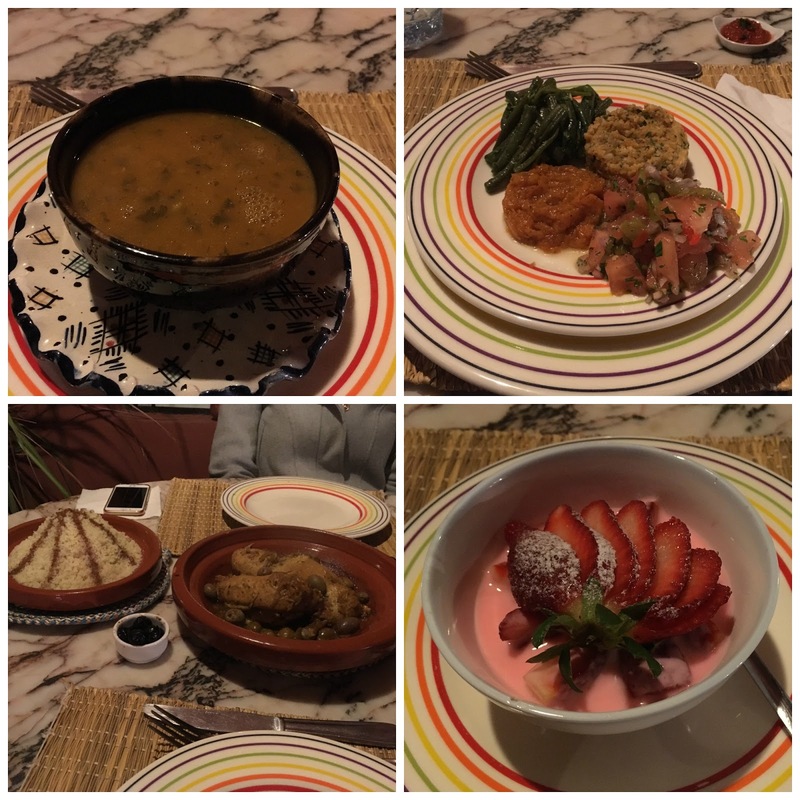 We started with the traditional Moroccan soup Hariri, followed by a selection of salads, one was green bean and garlic, one was potatoey, one definitely featured persimmon and the final one was tomatoey! All were absolutely delicious. This was followed by chicken and olive tagine with couscous and then strawberries and yoghurt. This was a delicious meal. We also had breakfast in our Riad everyday on the rooftop in the sunshine! First was a selection of breads with jams. Also when the owner discovered that we didn't drink coffee or tea they made us a beautiful fruit salad every morning. On the second day we ventured to Jardin Majorelle or Yves St Laurent's garden out of the main Medina area of Marrakesh. I wrote down that we had lunch at Kama 19, but when I google I get nothing! Anyway it was a cafe/patisserie/ice cream shop just by Jardin Majorelle. 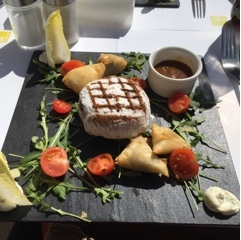 We had Briques, another Moroccan speciality. The mini samosa looking things were filled with cheese and shredded lamb. The big one in the middle was chicken. The weird thing was that it was covered in icing sugar!! Still delicious though! 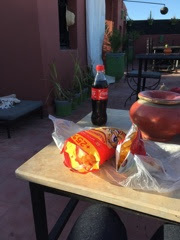 We thought that we'd have a rest on the rooftop of the Riad, so we chilled out with coke and some snacks, which tasted a bit like popcorn! For dinner that night we went to La Trattoria in Gueliz on a recommendation. I apologise for the darkness of these photos but it was pretty dark in the restaurant! I went for Chicken and Mushroom Tagliatelle, my friend had a tasting plate of three different pasta, ravioli, cheese penne and spaghetti. It was really good and a nice break from all those tagines! I also had a pear and olive almond cake pudding. We also tried Moroccan wine, white, and it was, well not very good! The following day we went to Cafe Clock for lunch. 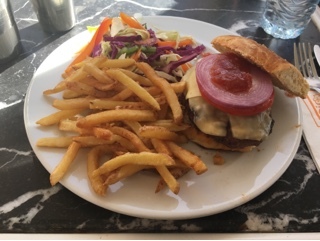 They had camel burger on the menu so we went for that. It was seriously the toughest thing I have ever eaten! Really don't bother! That evening we went on a food tour of Marrakesh, more about that in a separate post. The following lunch was spent at Nomad, close to the spice market. We both went for the Nomad Couscous for main, which was super. We also had dessert. I went for the Moroccan Date Cake with Salted Caramel Sauce and my friend went for the Chocolate Cake both were really good. 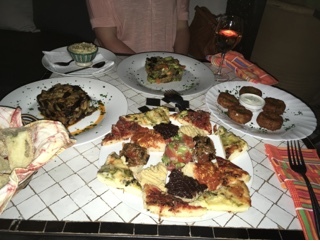 That evening we went to Cafe Bazaar and had tapas. We had way too much food, but it was yummy! We tried Moroccan wine again, this time red and rose and it was much better this time. Our last lunch we had at the Riad whilst waiting for an airport transfer. We had salads to start with, lamb tagging and then a filo, kiwi stack. Yum! I had a lovely time in Marrakesh and I really enjoyed the food. The food tour definitely gave us a flavour of everything available and I would totally recommend it.